She is the embodiment of selfless love, the supreme symbol of radical compassion, and, for more than a millennium throughout Asia, she has been revered as “The One Who Hearkens to the Cries of the World.” Kuan Yin is both a Buddhist symbol and a beloved deity of Chinese folk religion. John Blofeld’s classic study traces the history of this most famous of all the bodhisattvas from her origins in India (as the male figure Avalokiteshvara) to Tibet, China, and beyond, along the way highlighting her close connection to other figures such as Tara and Amitabha. The account is full of charming stories of Blofeld’s encounters with Kuan Yin’s devotees during his journeys in China. 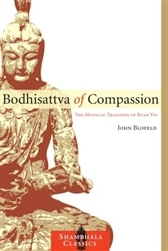 The book also contains meditation and visualization techniques associated with the Bodhisattva of Compassion, and translations of poems and yogic texts devoted to her.